Chili Pan Mee is a popular spicy Chinese Malaysian noodle dish. 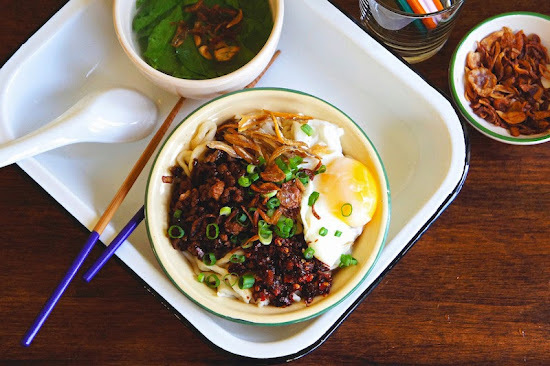 This dry version noodle is made with homemade Chinese's egg noodles and flavored with crispy and spicy roasted chili paste, garlic oil, and top with some savory meat, fried anchovies, and poached egg. To complete the dish, serve the noodle with some anchovy soup with Sweet Leaf. It's also known as Mani Cai or Sayur Manis in Malaysia. Heat a wok or skillet over high heat and add the peanut oil. Add shallots, cook until golden in color. Then mix in garlic and cook until the mixture is fragrant. Add in the ground pork and continue to fry until the meat is cooked. Mix in the cooking wine, soy sauce, and dark soy sauce. Stir-fry the meat mixture until browned and crisp. Moisten the meat mixture with some water, season with salt and pepper. For the noodles: Divide the dough into 3 to 4 pieces to make handling easier. Generously dust a large surface with flour. Roll each portion out with a rolling pin until as flat and thin as you can. Fold and dust the thin sheet of dough. Then slice the noodles into ¼ inch wide strips. Repeat the process with the remaining dough. When ready to serve: Bring the anchovy broth to a boil. Add some vegetables. Season the soup with some salt and pepper. Meanwhile, bring another pot of water to a boil. Cook a portion of the noodles until al dente. Remove the noodles with a wire strainer and shake off any excess water. Then cracked in an egg into the boiling water. Let it the egg cook for about 3 to 4 minutes,use a wire strainer to scoop the egg.Remove and set aside. To Serve: Place the cooked noodles in a serving bowl. Top with some savory meat, Spicy And Crispy Chili Paste, Crispy Garlic Butter Oil, Deep-Fried Anchovies, Crispy Fried Shallot, poached egg, and sprinkle with some chopped scallions. To savour: Toss everything together; adjust with additional Spicy And Crispy Chili Paste, if desired. Serve the Pan Mee with a bowl of sweet vegetables soup. Hi. I tried to get mani vegetables here in Germany so often already - sadly without any luck. My Vendor is not able to order it as well. Is there a way to substitute the mani vegetable swith something else? Bok Choi? Kangkung? You can use "choy sum" or Chinese spinach.